Former England and Derbyshire bowler, Dominic Cork, has agreed to provide specialist support on a consultancy basis ahead of a busy period of white-ball cricket for Derbyshire. Cork, who appeared in 37 Tests and 32 ODIs for England between 1995 and 2003 claiming 172 wickets, will provide additional support to the players as the county push for quarter-final places in both white ball competitions. The 44-year-old is one of a number of key professionals the club are looking to bring in on an occasional consultancy basis to work alongside head coach John Sadler to provide specialist support in key areas. Cricket advisory director, Kevin Dean said: “This is a crucial period for the Club as we push for a quarter-final spot in both white ball competitions over the next fortnight. 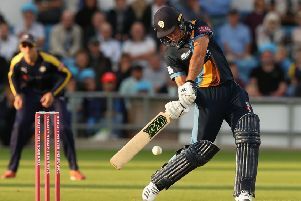 “Dominic is an experienced cricketer who knows how to win, claiming silverware with both Derbyshire and Hampshire during his playing career.